The philosophy of the physics major at Mount Union is to develop a strong undergraduate knowledge of the fundamentals of physics. Students also develop skills in scientific inquiry, problem solving, and laboratory techniques. Students can explore our place in the physical universe through majoring in physics with a concentration in Astronomy. Every major will experience independent research, along with both oral and written presentations on physics topics of their choice. 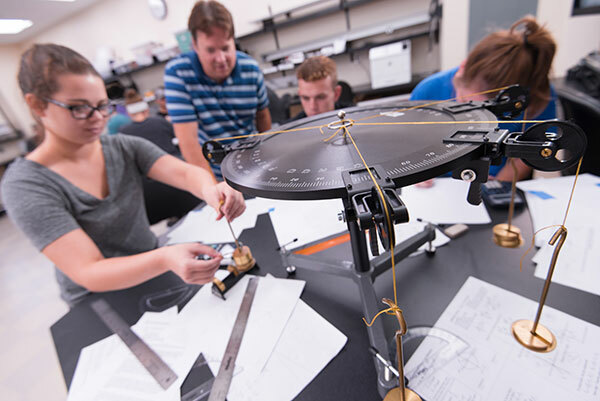 Mount Union’s Department of Physics and Astronomy features hands-on, activity-based experiences for students at all levels. This includes setting up and using advanced laboratory equipment, a dedicated electronics laboratory and a rooftop observatory for astronomy. In addition, the department has two new introductory physics laboratories, which are designed to allow students to actively learn physics using computers and sensors for data collection and analysis. Advanced courses for majors and minors provide rigorous mathematical and applied training in a small classroom environment designed for student success. Student research projects revolve around their interests and aspirations, which helps develop the individual for success at taking projects from an idea through to a final result. Flexibility exists within the courses that satisfy the major, which allows for the curriculum to conform to individual needs. The curriculum can prepare students for graduate study in physics, engineering, astrophysics, or astronomy, and prepare students for technical jobs in science and industry. Most students earn a simultaneous minor in mathematics through the completion of the required extra-departmental courses. Double majoring is also possible with recent students completing degrees in physics along with mechanical engineering, math, music, business, writing, computer science, and others. Students interested in physics or astronomy are urged to talk with members of the department at their earliest opportunity. Students pursuing a bachelor's degree in physics at Mount Union will explore the theory of how the universe behaves through real-world experiments by gaining hands-on experience by working with faculty and peers in and out of the classroom.